Whether we like it or not, diabetes affects our lifestyle and we have to be careful to keep our lifestyles healthy as a result. Medication may help keep our sugar levels down but other factors can play a part too. The following tips are probably those you've been told many times before - but some of them may be new to you. 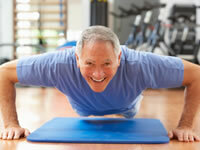 A contributing factor to general health is your level of fitness. Whether you're down the gym 3 times a week or simply going for a walk - physical activity is essential in order to keep your fitness levels up. The government advise people to exercise at least 3 times a week for 30 minutes. A study from the University of Bristol in 2010 showed that people who ate whilst using their computer were less aware of what they had eaten and also felt less full than participants who were not using their computer. It is thought that eating whilst working or watching TV is linked with overeating and snacking, which help to promote weight gain. Smoking carries a number of dangers such as an increased risk of cancer, heart disease and stroke. Smoking is even more dangerous if you have diabetes because it affects circulation and can double the chance of developing diabetic complications. What's more, you can save a considerable amount of money if you give up smoking. Try our smoking calculator. The NHS advises trying to get 10,000 steps into your day. This works out as about 5 miles but is quite achievable over the course of the day. Adding a stroll outside to your day will certainly help to meet the target. Excessive alcohol affects the body in a number of ways. Alcoholic drinks have a high calorific value which means that weight gain is commonly associated with drinking. Drinking affects the body’s small blood vessels (capilliaries) which becomes detrimental to many of the body’s functions such as the kidneys, eyes and is also a leading cause of sexual dysfunction. In the short term, alcohol will also make blood sugar control harder to manage. If you'd like to know how much you drink, try our cost of drinking calculator. One of the best ways to stay healthy is to ensure fast food and take aways are not a regular part of your diet. The occasional visit is not going to harm you but you need to be honest with yourself about whether the occasional visit is becoming a regular event. These factors help to increase insulin resistance, raise blood pressure and increase cholesterol levels, which over the long term contribute to more difficult blood glucose control as well as increasing the risk of diabetic complications. They say ignorance is bliss, but for diabetes this can only be a short term effect. If you get a nasty surprise when you see the levels, don’t let this put you off. Taking steps to control your levels will start to give you more assurance. Take a break from stress wherever you can. Often we react to stress by trying to beat it only to get drawn in further. Try not get consumed by stress. During times of pressure, allowing your mind freedom of thought can be helpful. Going for a walk or leaving a decision until the next day can be effective ways to reduce stress and a number of other methods are available.